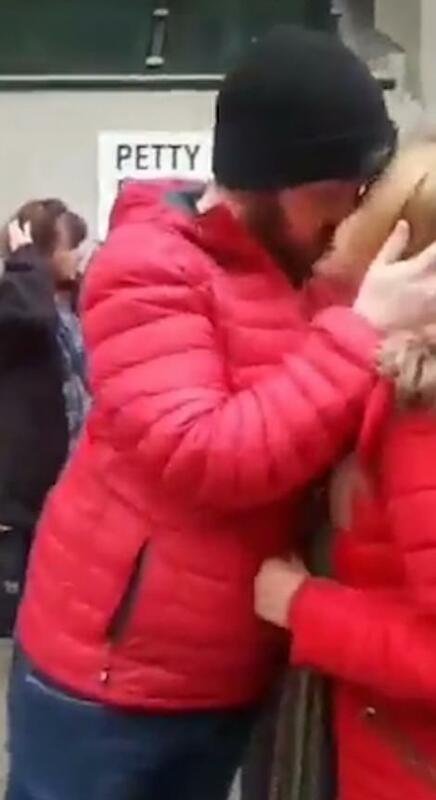 Yellow vest campaigner James Goddard has been reunited with activists as he is released on bail after his arrest in London today on suspicion of a public order offence. 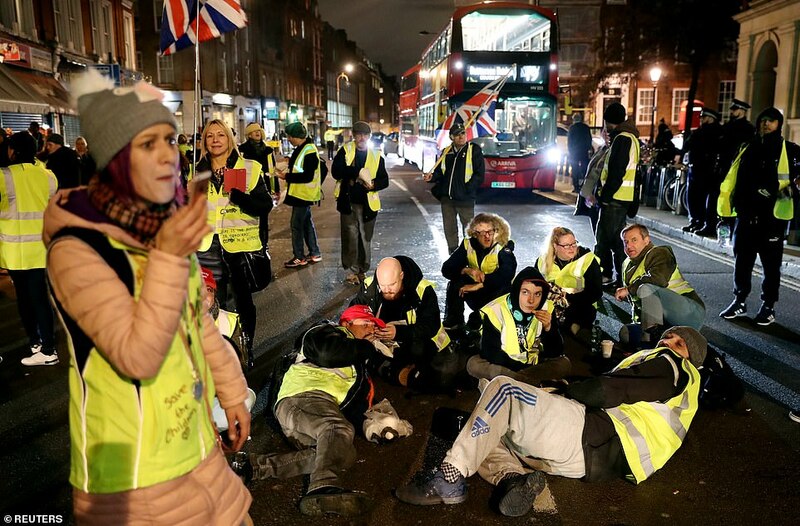 Police confirmed that a man – understood to be Goddard – was arrested outside St James Park tube station on Saturday as activists took to the streets in a ‘gilet jaunes’ inspired march. 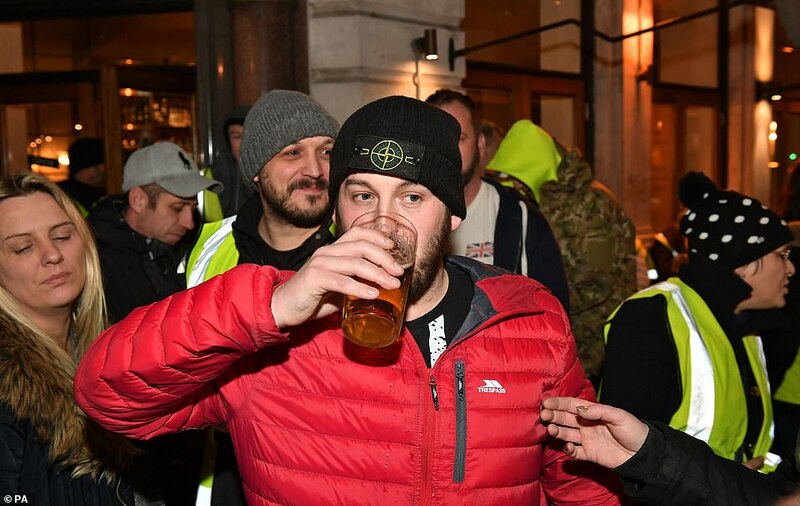 But this evening Goddard was pictured being handed a cigarette and pint at the Queens Head pub in Holborn after being released on bail. 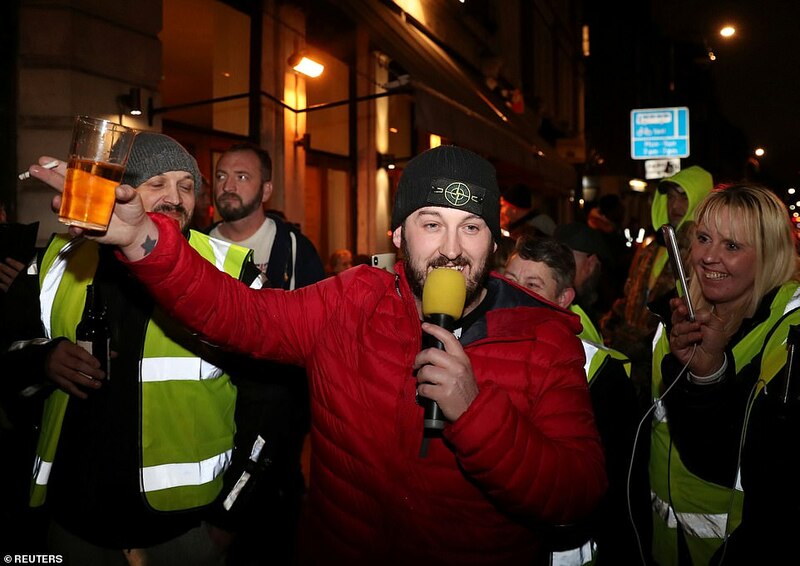 Wearing a red puffer jacket and Stone Island hat, he addressed a crowd who had gathered to celebrate his release this evening. 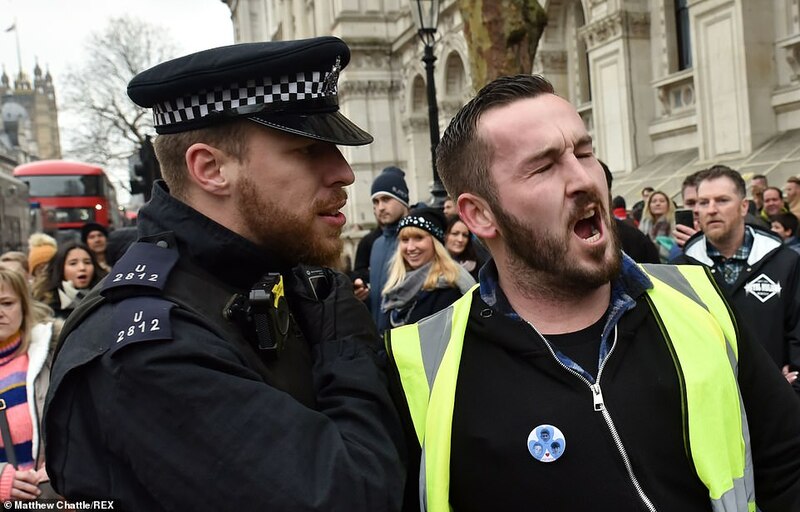 It is understood his earlier arrest was in connection with MP Anna Soubry being harassed outside Parliament during live television interviews in College Green on Monday. 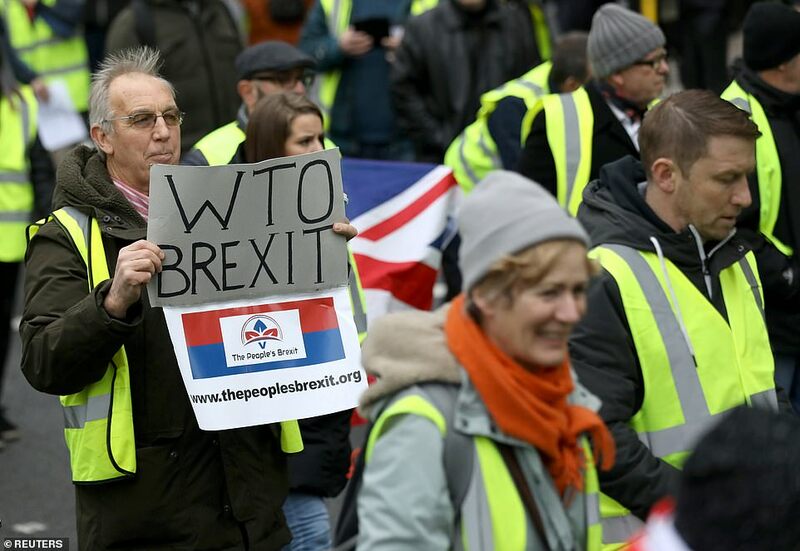 Goddard’s supporters, marching in London to demand Britain leaves the European Union, claim he was preparing to hand himself in at Holborn police station at midday. 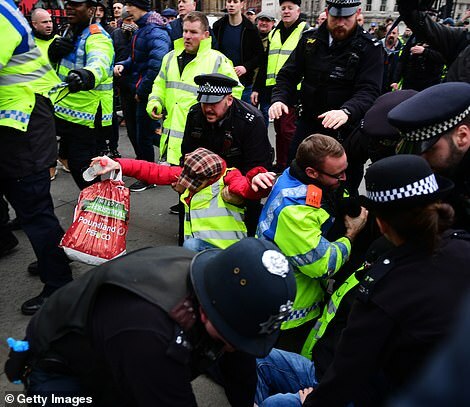 Violence erupted as activists took to the streets of central London while police tried to contain crowds during the heated rally. 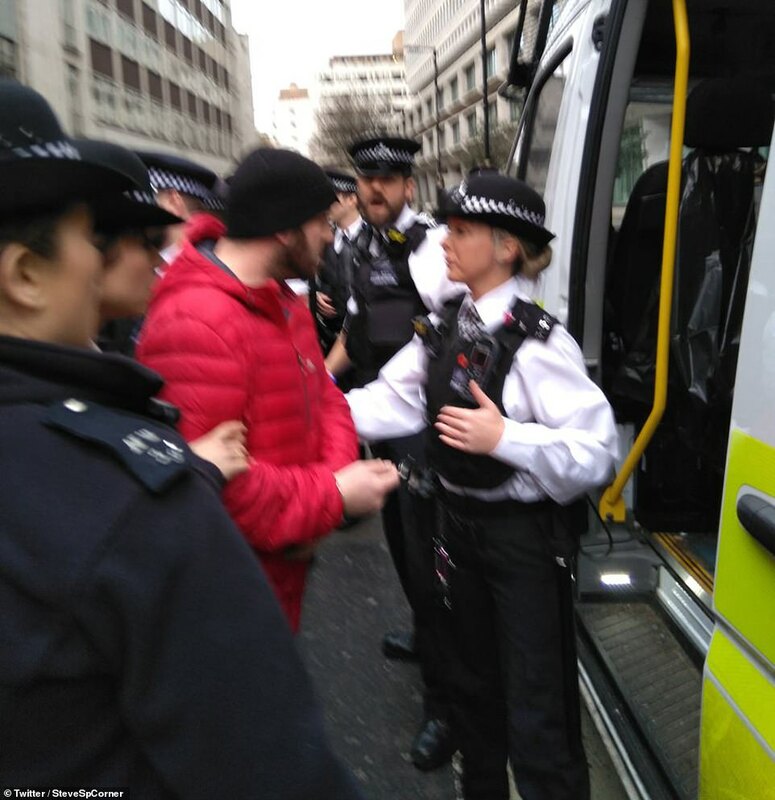 Footage captured Goddard being detained and taken into a police van as shouts of protest can be heard. 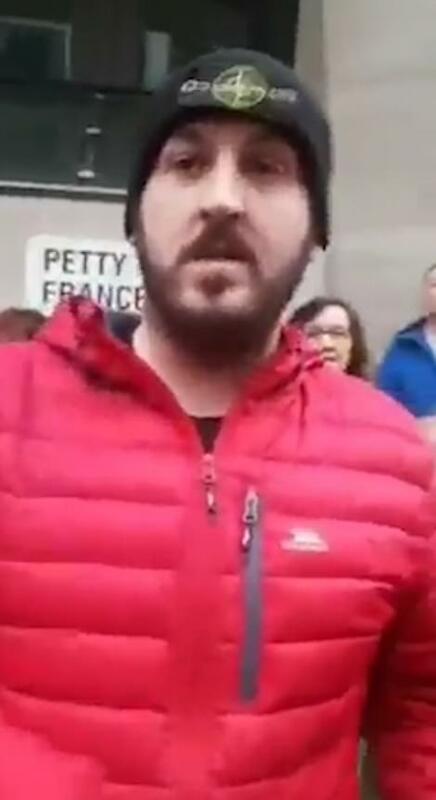 Police have not confirmed what public order of offence charge the man was arrested on. 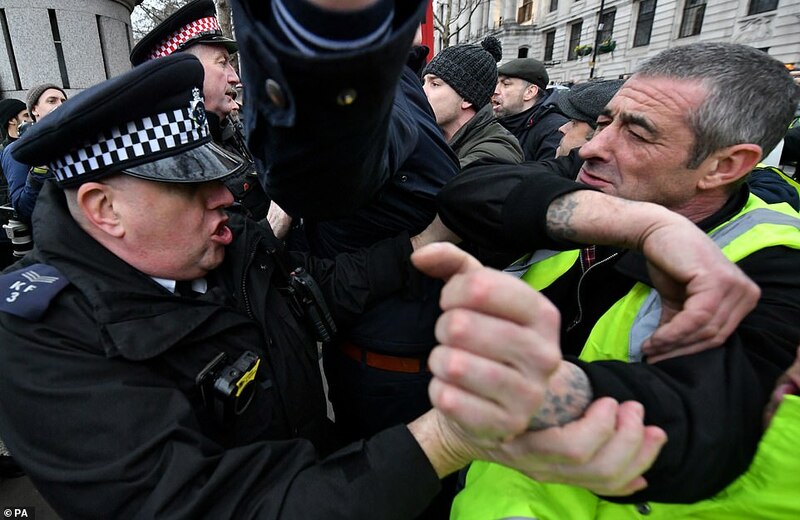 The Metroplitan Police said in a statement: ‘We can confirm that a man in his 30s was arrested at 11.42hrs on Saturday, 12 January outside St James Park tube station on suspicion of a public order offence. 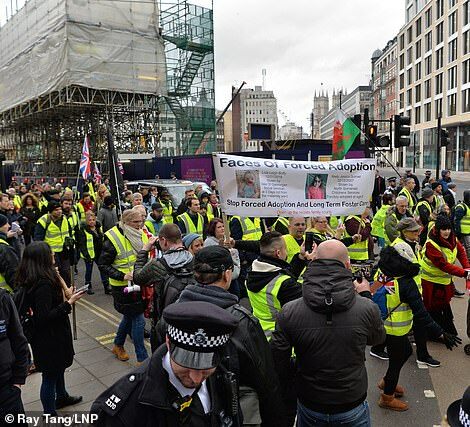 A spokeswoman said the arrest related to an incident which took place in Westminster on Monday January 7. 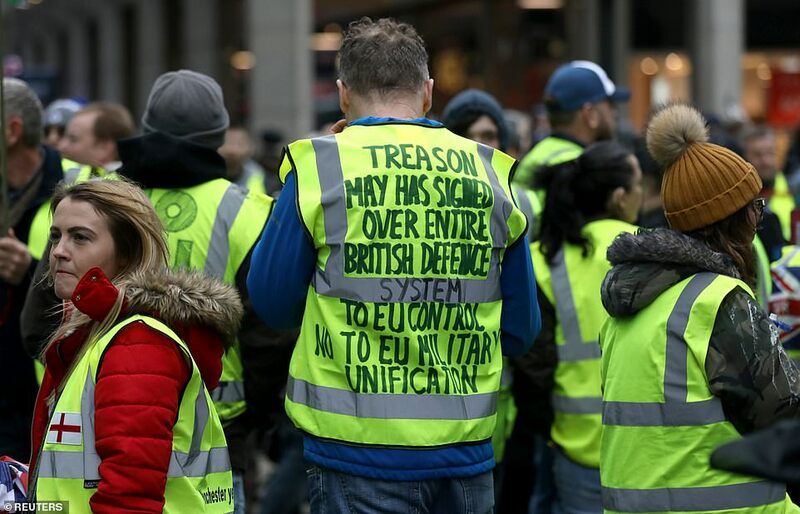 The arrest happened as hundreds of people gathered ahead of a ‘yellow vest’ inspired anti-austerity march as they called for a national day of action today. 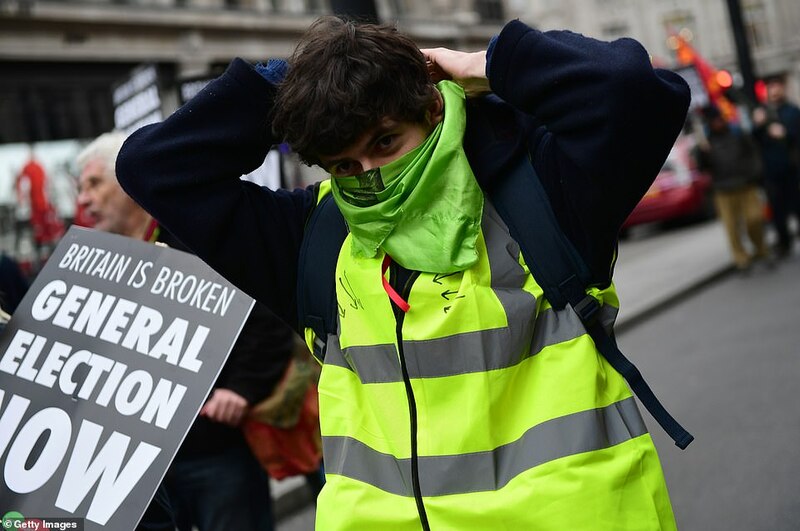 Protesters opposed to the government’s austerity programme and demanding a general election marched through the centre of the capital before rallying in Trafalgar Square. 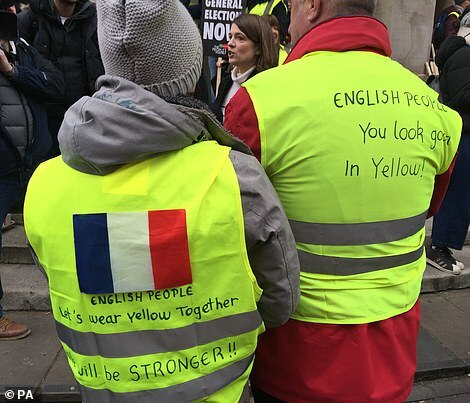 Hundreds of protesters joined the crowds wearing yellow vests with slogans such as ‘Britain is Broken’ written on the back. 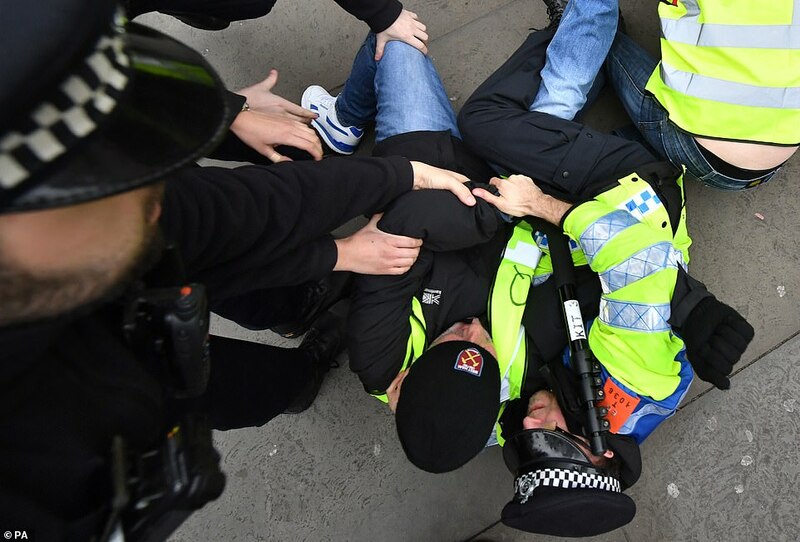 Clashes broke out between protesters and police officers, with some activists being detained on the ground during the scuffles. 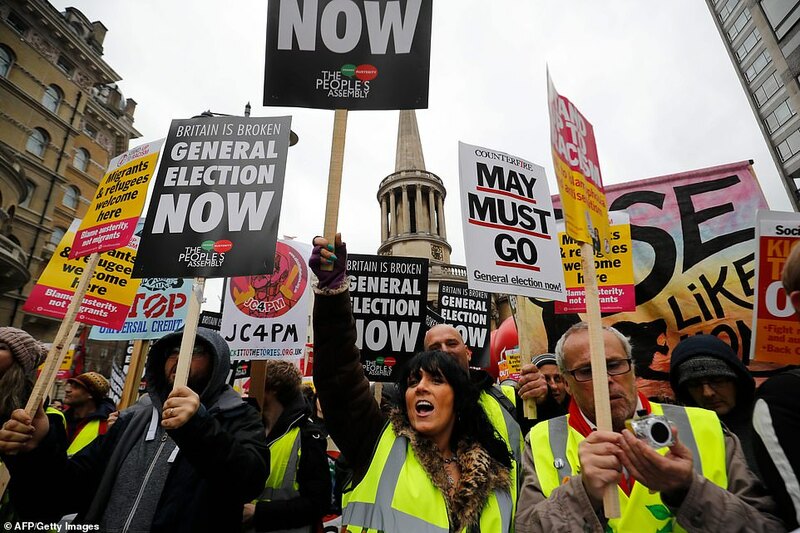 Organised by The People’s Assembly Against Austerity, the demonstration called for for a general election. 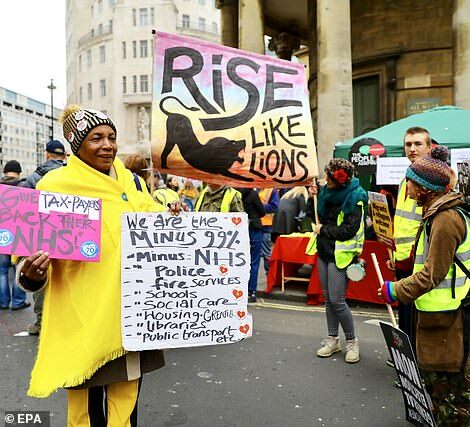 Addressing the crowd in Trafalgar Square, Labour’s shadow finance minister John McDonnell said eight years of austerity under the ruling Conservatives was ‘tearing apart the very social fabric’ of Britain. 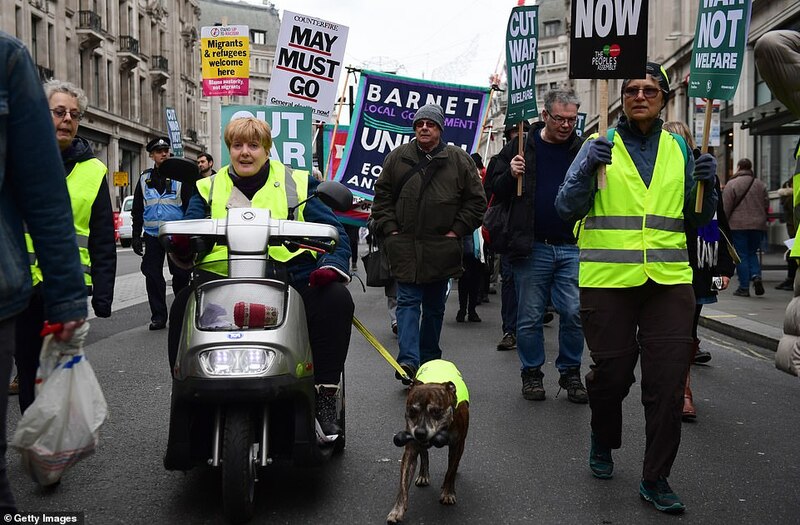 He said: ‘We need a general election now to bring about the fairer, more equal society we all want to live in’. 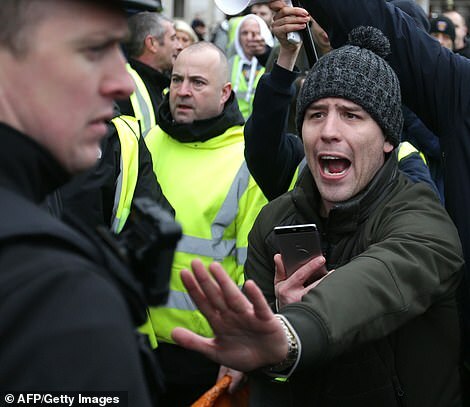 Goddard, originally from Leicester, was in a gang of agitators that surrounded Tory MP Anna Soubry on Monday, allegedly calling her a ‘Nazi’ and a ‘traitor’. 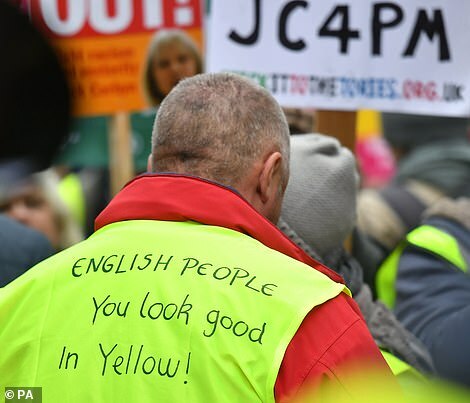 He is a vocal supporter of Tommy Robinson and asks for online donations to support his ‘yellow vest’ campaign. Goddard also allegedly abused Owen Jones, branding him a ‘communist bully’ and a ‘lying little toad’ whose ‘parents must be ashamed’. 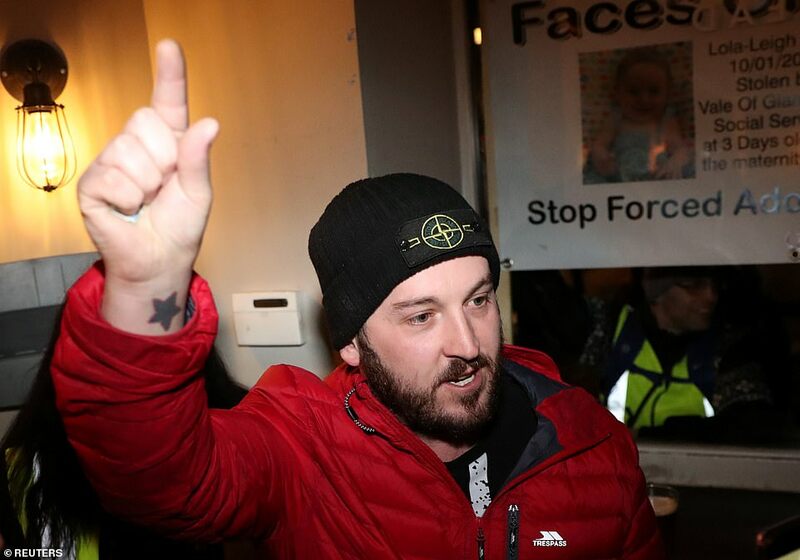 As people called for him and his supporters to be arrested he said he ‘has nothing to apologise for’ and said he has a right to abuse MPs. He said that Ms Soubry had treated him and others ‘with contempt’ and ‘deserves’ the barracking she receives and said she ‘wasn’t verbally assaulted’.